This charming Laupahoehoe ocean bluff home overlooking Laupahoehoe Point was under contract just two weeks after it hit the market. Due to no fault of the property, it just fell out of escrow and is once again available for $450,000. There was a lot of interest in this home and given the property’s amazing Pacific Ocean views and convenient Laupahoehoe location, I’m sure it won’t take long to find another buyer. With 880 square feet of light and airy living space, including two bedrooms and 1.5 bathrooms, this home is ideally suited for someone looking to retire to Hawaii. The 0.3-acre property is easy to maintain and contains a variety of tropical fruit you can eat year-round. Imagine eating luscious pineapple or citrus picked fresh from your yard! Add Hawaiian vanilla to your favorite dishes (the vanilla bean grows in orchid plants and is a specialty crop here on the Big Island). 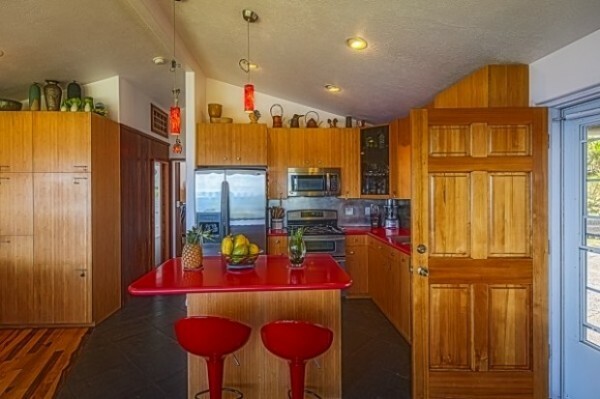 A great deal of thought went into the design and details of this Laupahoehoe home (MLS# 263262). Originally built in 1966, the home has been remodeled from top to bottom. From the vaulted ceilings and the rare ironwood flooring to the Italian ceramic tile, every part of the home has been upgraded. Improvements were made behind the walls as well — the entire electrical system was rewired, and the walls and roof were reinforced. An open floor plan provides ocean views from the kitchen and living room. A kitchen perfect for entertaining or informal dining. The kitchen, which includes stainless steel appliances and a double oven, provides plenty of cabinet storage and counter space. The focal point of the kitchen is a large island with a custom red countertop and matching custom bar chairs. Perfect for entertaining or informal dining, the countertop color pops against the neutral wood tones of the kitchen and living room. 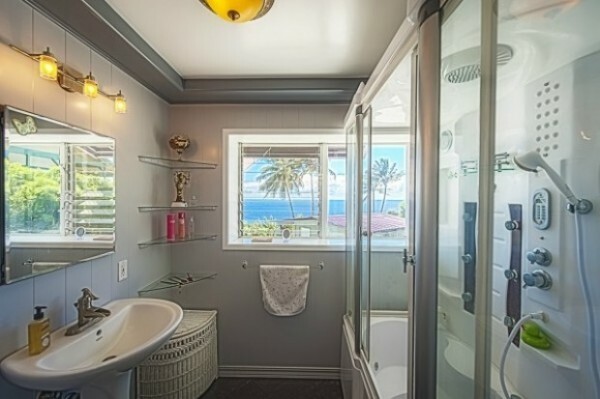 Every room in the house has ocean views, even the master bathroom! When the house was remodeled, two bedrooms were combined to create the spacious master suite, which is large enough to include a home office. What’s more, every room in the house has ocean views, even the master bathroom! As charming as this house is, (and it really is quite pretty), I think most people are drawn to it because of its location. 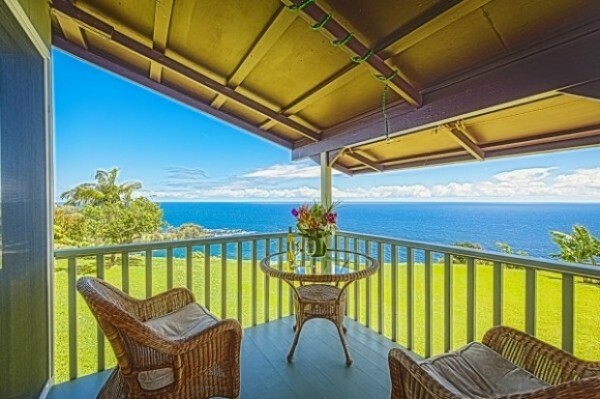 The Laupahoehoe Point views from this Hamakua Coast home are simply stunning! What’s more, you can enjoy the views while sitting on the covered lanai. With year-round warm temperatures and balmy trade winds, you can enjoy breakfast or relax with friends with breathtaking Pacific Ocean views. What’s more, humpback whales can be seen in the winter months when they visit Hawaiian waters. Enjoy the views while sitting on the covered lanai. 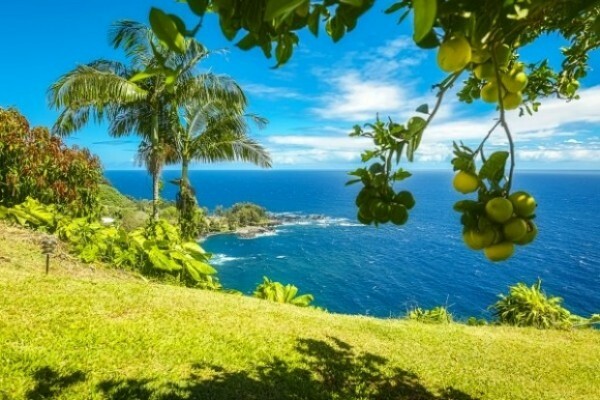 With its million dollar views and great location at an affordable price, this Hamakua Coast property is a great opportunity to begin your Hawaii Life. For more information on this Laupahoehoe property, give me a call today at (808) 963-6880.